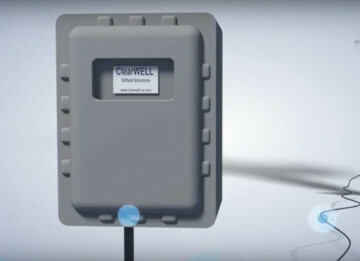 ClearWELL™ is an innovative and patented scale control technology designed to protect onshore and offshore oil and gas production and surface processing equipment. 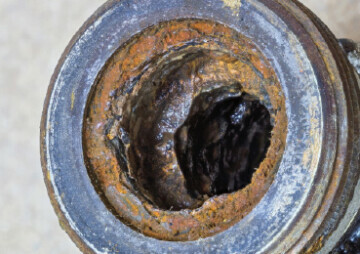 Unlike chemical injection, acidizing, or other type of workover, ClearWELL™ requires zero well intervention or downtime to address scale deposition. It is quickly and easily installed by connecting the unit directly to surface production equipment. 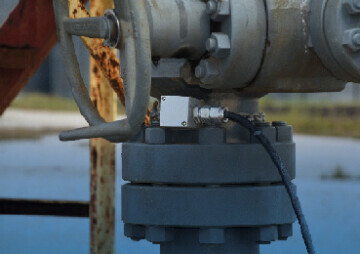 The electronic unit transmits pulsed radio frequency signals, via a metal to metal union, along pipework and equipment which prevents scale deposition. The technology is low cost to rent and operate, provides long-term continuous protection with low power consumption which can be delivered via solar energy. The technology is environmentally friendly, safe, low risk and saves millions of dollars in remediation work and lost production in a year. 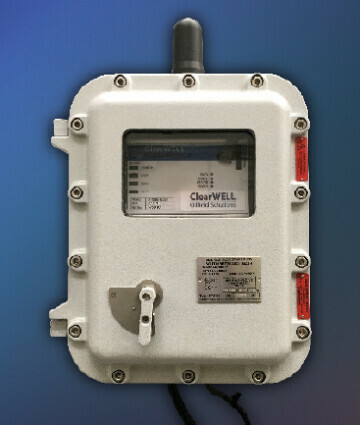 ClearWELL™ transmits a fluctuating, pulsed radio frequency (RF) signal down the production tubing or through the process system. When the energy from the RF signal interacts with the scale forming solvated ions in the produced fluid, it promotes the formation of homogenous scale particles which don’t stick to surfaces. They remain in suspension as tiny crystals and are carried out of the wellbore. Scale in a fully formed inert state is not a problem but active scale sticking to surfaces and equipment is a problem. 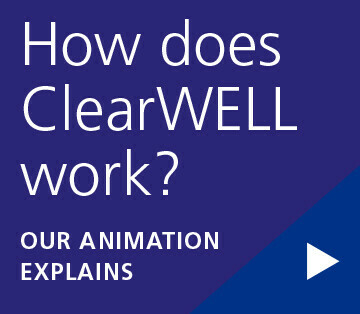 ClearWELL™ stops scale from sticking, ensuring maximum production flow. Mineral scale, often calcium carbonates or barium sulphates, normally form when there is water in the produced fluid or gas. Mineral ions are present in solution at the beginning of the production fluid’s journey from reservoir to surface, but a small change in well conditions, such as temperature or pressure (which occurs naturally as the fluid travels up the well bore through varying depths, or reaches a constriction in the pipeline, or encounters equipment such as artificial lift pumps) will change the water’s ability to dissolve them and so the scale formation process begins. The surface of a pipe provides the ideal opportunity for scale to form, by reducing the energy required to change from solution to solid. This is why scale is formed preferentially on surfaces, and especially around equipment or narrowing of pipelines. How does ClearWELL affect scale formation? Scales form on surfaces as ions require less energy to move from a dissolved state in the fluid to a solid state on an existing metal or, already growing, mineral scale surface. In a typical oilfield gas-water or oil-water mixture scale forms either in the bulk water as an homogenous crystal or at an existing surface as an heterogenous crystal. ClearWELL adds energy to the system so charged, solvated ions pick up additional energy from their kinetic interaction with the ClearWELL pulse. This decreases the energy ‘advantage’ that formation on a surface has and promotes formation of a higher percentage of scale as homogenous nano-particles in the bulk liquid phase. The ClearWELL effect is strongest closest to the pipewall, exactly where it has the biggest impact in reducing scale growth and adherence. 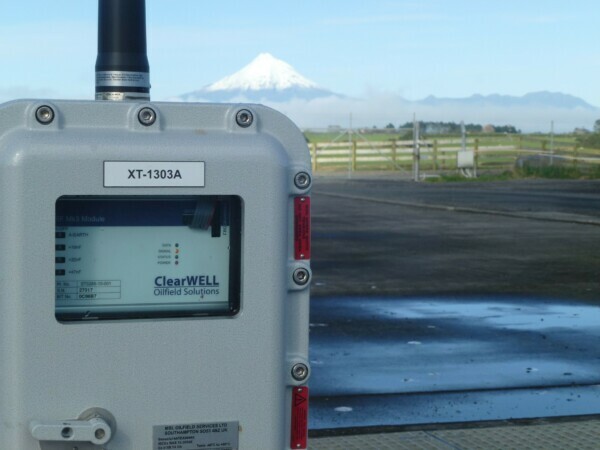 The ClearWELL™ system is very effective where supersaturation events occur in the wellbore. Supersaturation of the fluid with mineral ions means that it is saturated to capacity and only requires an extremely minute change in well conditions to cause an accumulation of scale deposits. ClearWELL™ limits supersaturation by controlling precipitation with continuous deposition of nano-, homogenous scale crystals, maintaining the produced water in a non-supersaturated state. Robust unit design – durable in extreme environments and available for use in hazardous areas (zones 1 and 2) with full ATEX/IECEx certification.